1 container – pipes, 2 elephants, a horse and a fire engine! Zenda is a small village miles from anywhere in northern Malawi. The road over a stream to the school is impassable in the wet season. Hence no children go to school for 3 months of the year. This will soon be a thing of the past as John Challis of the Raven Trust will be going out later in the year to build a culvert type bridge. Pipes have been donated by both George Leslie and a company in Ayr. They were delivered to Strachur a few weeks ago and taken to McKerrell’s yard for storage. It was here that they were loaded into the recent container by a team of local volunteers. Once in Malawi they will be held at Ekwendeni and then transported up to Zenda and the local work will begin. Also on this container are 2 elephants, a horse, a fire engine and a motorbike – part of a load of playground equipment bound for Msongwe from Northern Ireland. 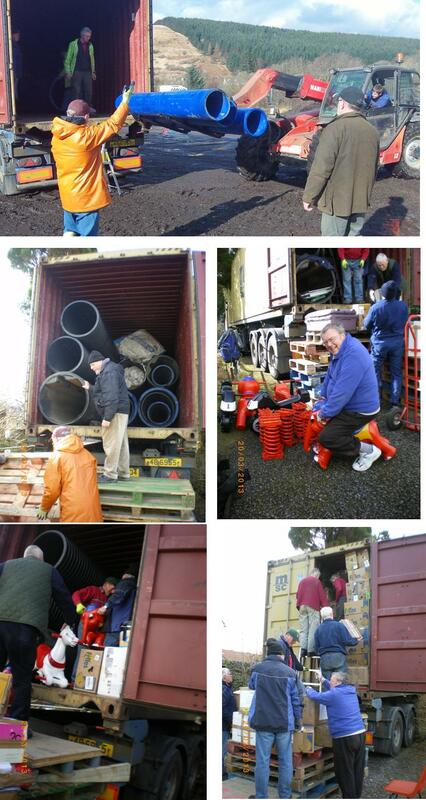 The pipes were loaded into the container by the staff at McKerrall’s and the container was then driven to the Raven Trust store where the playground equipment and over 300 boxes were loaded. Luckily the day was cold but dry. The Raven Trust would like to thank the donors, staff at McKerrall’s and, of course, our own band of willing volunteers without whom none of this work would be possible.